Last month, Palgrave published a book entitled The United Kindgom’s Defence After Brexit. 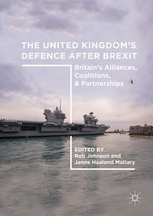 Britain’s Alliances, Coalitions & Partnerships, and edited by Rob Johnson (University of Oxford) and Janne Haaland Matlary (University of Oslo). I wrote the chapter on ‘Franco-British Defence Co-operation in the Context of Brexit’.